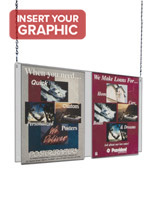 These double panel sign holders have 2 S-hooks for attaching to other overhead-mounting frames or accessories. The clear fixtures are designed to support two 8.5” x 11” posters side-by-side and can be used with single or double-sided graphics. The top-loading acrylic sign holders are 1/8” thick and pre-drilled with mounting holes. 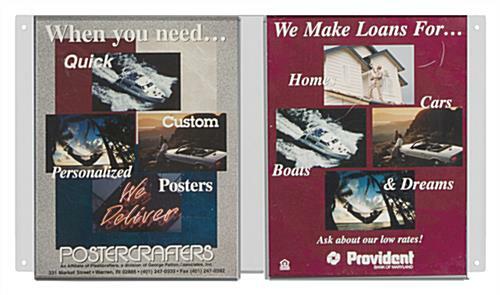 Overhead mounted signage is ideal for hanging graphics and advertising from ceilings or in store windows. These 2-panel portrait orienation sign holders are economical accessories that can be used alone or daisy-chained with other frames. The economical acrylic construction is designed for use with ceiling-mounted chain, monofilament or wire hanging systems. 19.5" x 11.1" x 0.25"